I am a total sucker for cute things, ask anyone! I love to have things coordinate and to have fun everyday items to brighten my day. When I came across this adorable wallpaper from Boatman Geller, I just couldn't wait to get it on my Ipad. The best part is that it is free! Click here to download wallpaper for your device or desktop computer. My Ipad is held inside my Boatman Geller Note Tote, now on sale at Sassafras Paper. I love the portability of this tote. 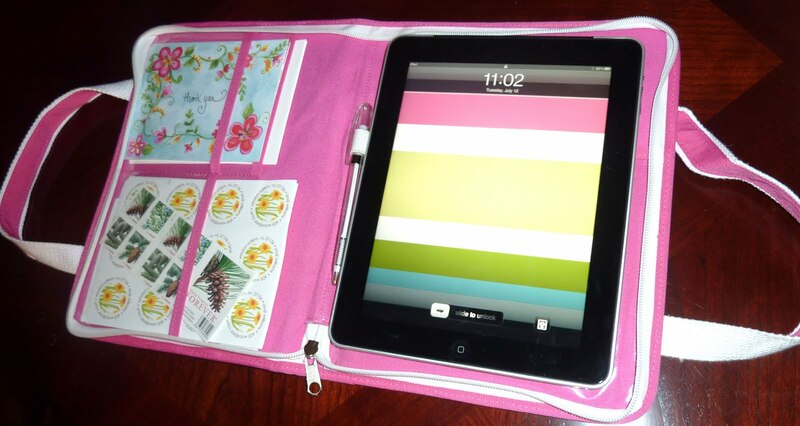 I can keep all of my cards, stamps, and labels in one place and it easily fits in a large purse for when I am on the go!